A road trip around Iceland’s Ring Road should be on everyone’s travel bucket list. If you’re looking for an adventure you’ll never forget this trip as it is unforgettable. We chased a countless number of waterfalls and volcanoes, soaked in geothermal hot springs, and explored beautiful glaciers. 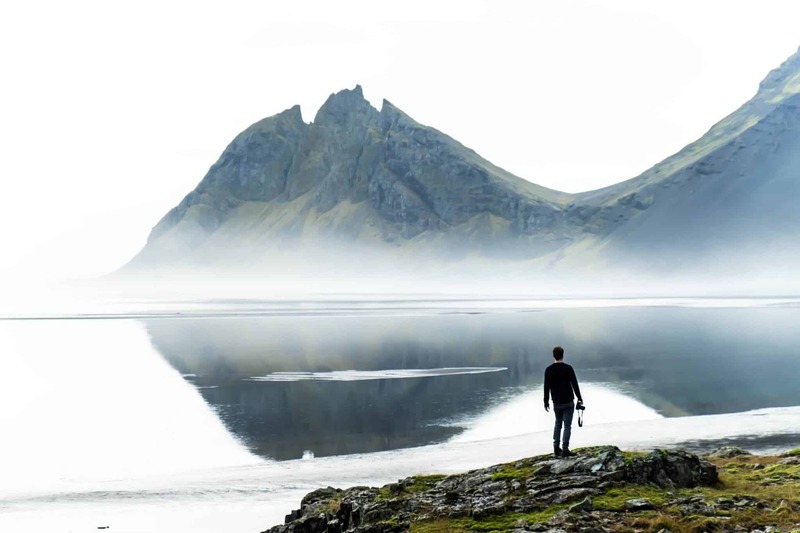 There is just so much to do and see in Iceland that’s it hard to ever get bored. It’s an outdoor fanatics dream. We spent 12 days venturing around Iceland and saw so many amazing things, but could have easily have spent months and not even scratched the surface. 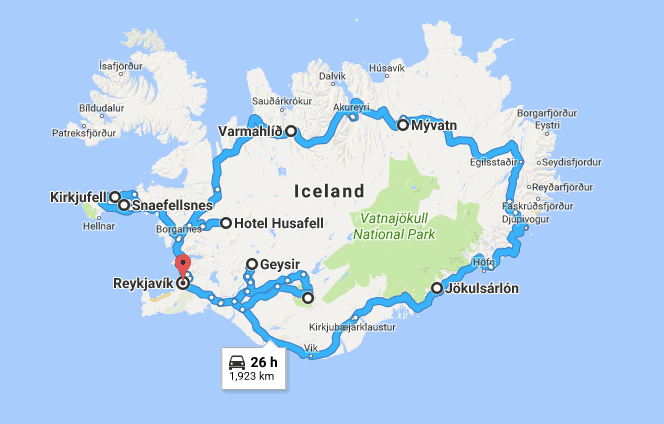 I wanted to share with you our Iceland Ring Road trip itinerary so you can do the same on your trip to Iceland! The name of the Ring Road should be pretty self-explanatory. It’s a road that covers around 1,300 kilometers and circumnavigates the whole country. The whole route should take about 16 hours if you drive non-stop. However, we’d recommend at least a week for your Iceland road trip itinerary. Why? You’re going to stop for photographs and want to admire the nature. We were constantly pulling off to the side of the road to go for a hike up a waterfall or to take photographs. Our trip took us 10 days which was a comfortable amount of time. It would be easy to tack on more or less. Most people choose to drive the Ring Road counter-clockwise for some reason, but we found it didn’t matter. 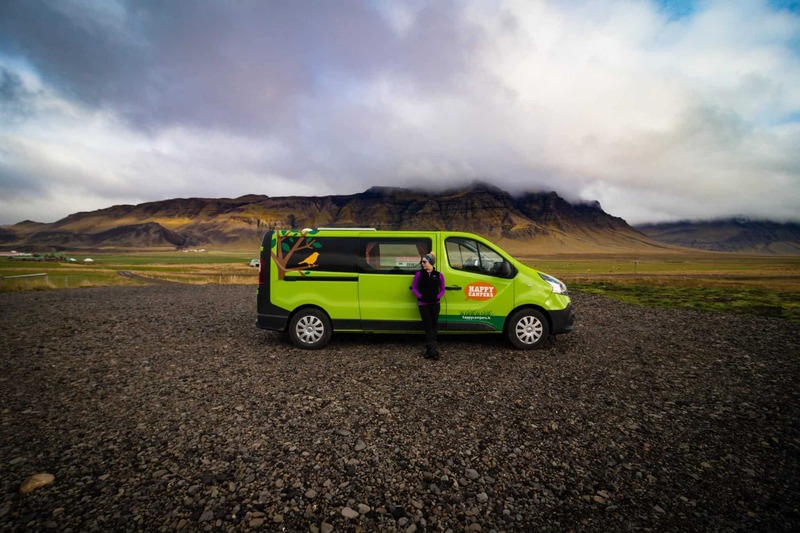 If you plan to make it around Iceland on your road trip a car rental is essential. 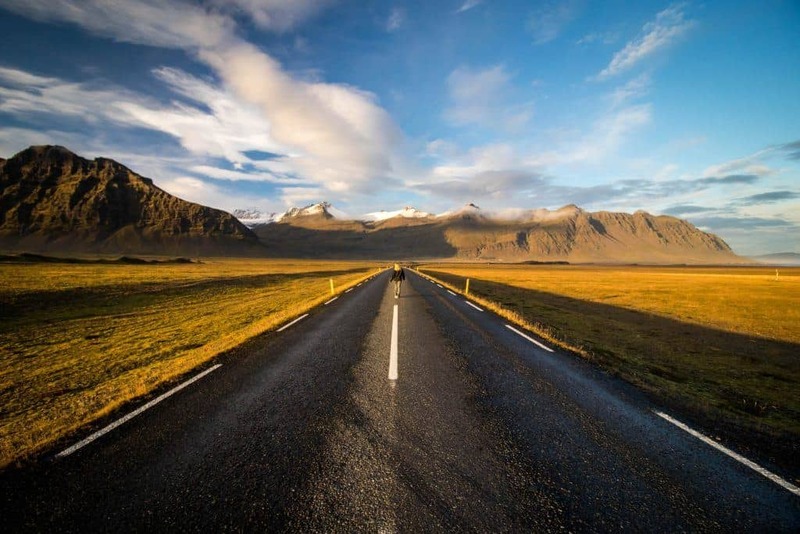 We’d recommend you skip out on a tour and do the drive yourself as Iceland is a pretty easy destination to travel. With your own car, you have the freedom to stop when and where you want. We drove around the Ring Road in a Happy Campers van. By renting a camper van we were able to cover our accommodation and transport at one price. We’d drive whatever felt comfortable that day and park in a campsite for the night. 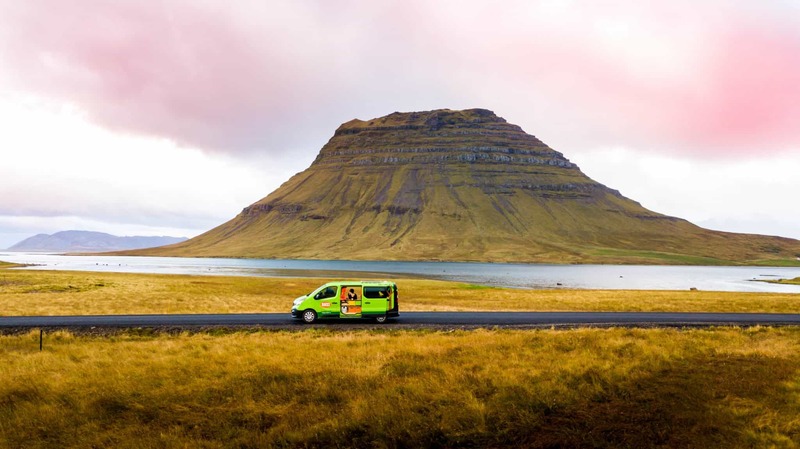 The van comes with all you could need for a camping trip in Iceland. It has awesome features such as a heater for the cold nights, running water sink, and a fridge/freezer. If you want to travel with a Happy Campers van like we did (and you should!) make sure to read our full review. You can easily book using this link, but make sure to book well in advance during high season. We always pick up local SIM cards and recommend every traveler does the same. We suggest picking up a SIM card. There is a store right down the road from where we picked up our Happy Campers, ask when checking out and they’ll point you in the right direction. Or you can pay €40 for the WiFi add-on for the duration of your Happy Camper rental. Also, we always download an offline map via Google Maps application and one via Maps.me. You cell phone GPS runs without needing data and since the maps are stored on your phone you have a working GPS for free! After driving overland across Africa, we don’t play around with directions – granted you’re only driving one road in Iceland! Be prepared to shell out some money when you head to the pump in Iceland. Gas costs nearly $2 USD a liter or $8 a gallon in Iceland. We also found American credit cards do not work at many of the pumps. To pay to make sure you ask an attendant to unlock the pump and then pay afterward inside with a credit card. Make sure to be aware of distances in between fuel stations, granted we found them all over Iceland. For our 10 day itinerary, we spent around $400 on fuel. Make sure to budget for this one, as it’s easy to forget. There’s a bunch around Reykjavik and one right next to the airport. We also found several along the Ring Road in the major towns so were able to stock up on groceries every two or three days. We’ve gone into detail on food costs and grocery stores in Iceland in a previous post. Where to Sleep on your Iceland Ring Road trip? Our accommodation was covered by our camper van. If you’re driving around in a standard rental car make sure to book your accommodation in advance. High season in Iceland can be intense and it’s easy to end up spending the night in your car! Iceland is cold. It may not be like traveling to Antarctica or Greenland, but you should bring along a packable down jacket. Other staples items include a good wool sweater, a rain jacket, hiking boots, and a scarf. Of course, if you’re big into photography, make sure to pack a great travel camera. If you need more check out our awesome post on what to pack for Iceland. We completed this Iceland rooad trip itinerary in early October and found the weather to be perfect. We had to wear jackets and hats, but we only had a view days of rain and a lot of wild fall colors! 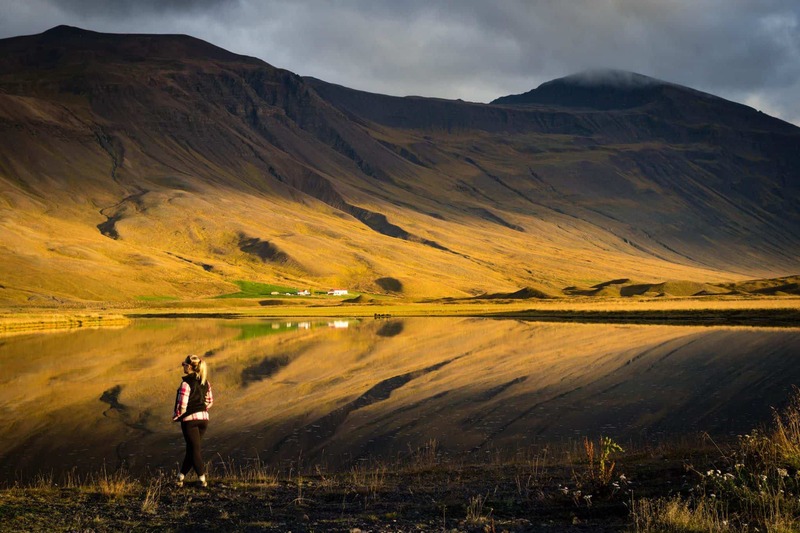 Start here to determine the best time to visit Iceland. You can only cover so much ground on the first day as you have a rental to pick up and groceries. We arrived in Reykjavik Airport early from the Faroe Islands a short transfer later we picked up our Happy Campers rental! Before taking off on a Ring Road tour head to the market. We stopped by Bónus, not knowing when we would come to another grocery store and made our way to the Snaefellsnes peninsula. 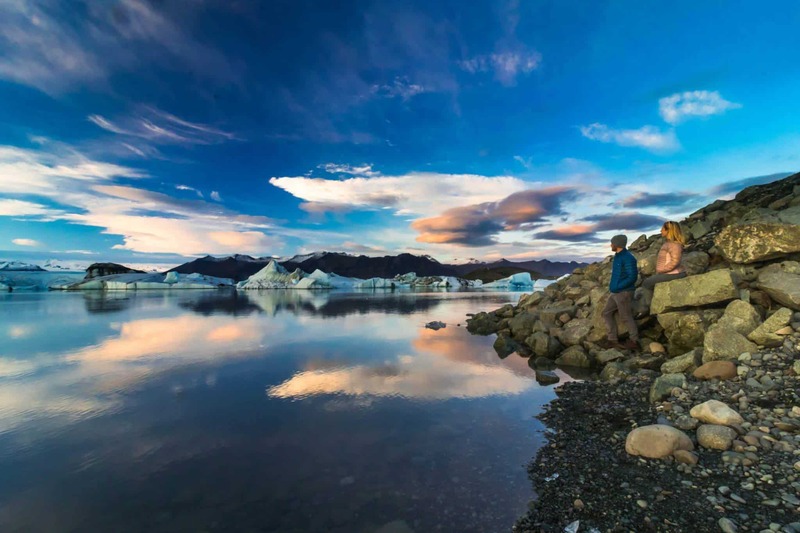 It was referenced as being “Little Iceland,” and one of the best regions to explore. The drive took about two hours from Reykjavik. For our first night stayed at a campsite near the volcano, Eldborg, and took a hike up the crater. It’s an easy 1.5 hour round trip walk, great for a leg stretch! Read more about what to wear hiking. Highlights in the area: Hike up to Eldborg for incredible views! The campsite we stayed at Snorrastaðir (2000 ISK per vehicle and included toilets, hot shower, kitchen, and WiFi). This was an amazing day as we drove the stunning peninsula. We stopped at Landbrotalaug a tiny natural hot spring that can fit two-three people. We then ventured on to Búðakirkja, a tiny wooden church that dates back to the 19th century. Around the church, there are multiple hiking paths and a lovely white sand beach. The next big stop was Snaeffelsjokull one Iceland’s major glaciers and setting for “Journey to Center of Earth.” It’s a sight to behold! After the glacier, we made our way to Kirkjufell with plenty of stops along the way. Although it was the offseason in Iceland, Kirkjufell was packed with nowhere to park a vehicle. All visitors are allocated to a tiny parking lot for maybe 20 vehicles in order to get the iconic shot of Kirkjufellsfoss and Kirkjufell. So, either show up super early in the day or prepare to fight for a parking spot. Since we couldn’t park our car we went around the corner to an empty side street and decided it was good enough to get a photo! We drove short ways down the road and camped in Stykkishólmur. The campsite we stayed at Stykkishólmur Campsite. It was closed for the offseason, but we were still able to park our camper van there with no facilities and did not have to pay. Stykkishólmur is situated at the most Northern point of the Snæfellsnes peninsula. It’s a beautiful harbor town that looks the same as it did in the 19th century. Next stop was Hraunfossar, as with everything we stopped several times along the way for photos and hikes. Which means we arrived at Hraunfossar around 5 pm just as the sun was setting. Out of all the waterfalls we saw in Iceland Hraunfossar was among the most unique. Husafell makes a great base for exploring the surrounding countryside. In the surrounding nature, you can expect to find woodlands, waterfalls, glaciers, rugged lava, crystal springs, wildflowers plus remarkable archaeological remains. We went for a wonderful hike up a nearby mountain. 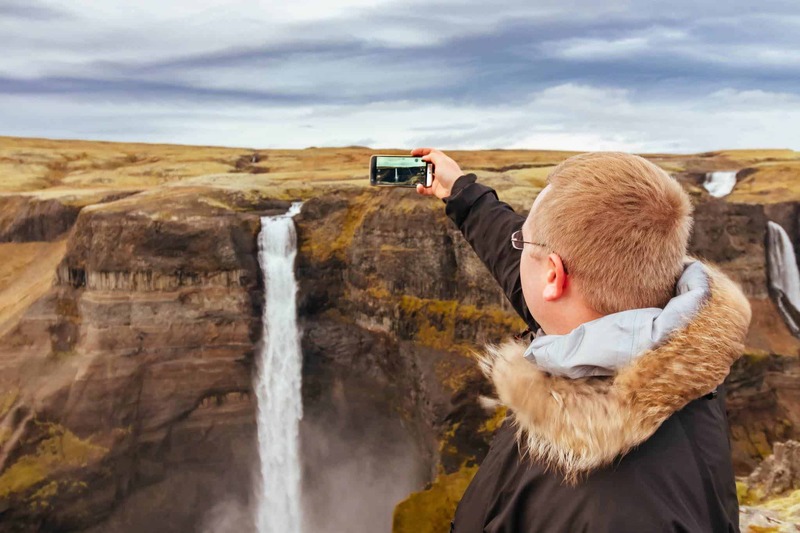 Highlights of the area: Take in the views at Hraunfossar, coffee in Stykkishólmu, Glacier Tour at Langjokull, Surtshellir and Víðgelmir caves. Where we stayed: Hotel Husafell. A high-end hotel, but very nice if you want a beautiful hotel to relax in with great amenities. A budget option is the Husafell Camping Site. After another early morning hike, we made our way to the Grabok Crater. Grabok is a perfectly shaped volcanic crater. There is a small parking lot for hikers and a steady path. The hike is short and takes anywhere from 10-20 minutes. Nearby is Baula, a picturesque mountain that is well worth a stop and some photos. We made our way to Varmahlid where we would be going on a horseback ride adventure in the morning with Hestasport. That night we stayed in one of their cute cabins and enjoyed their private hot springs with some sundowner drinks! 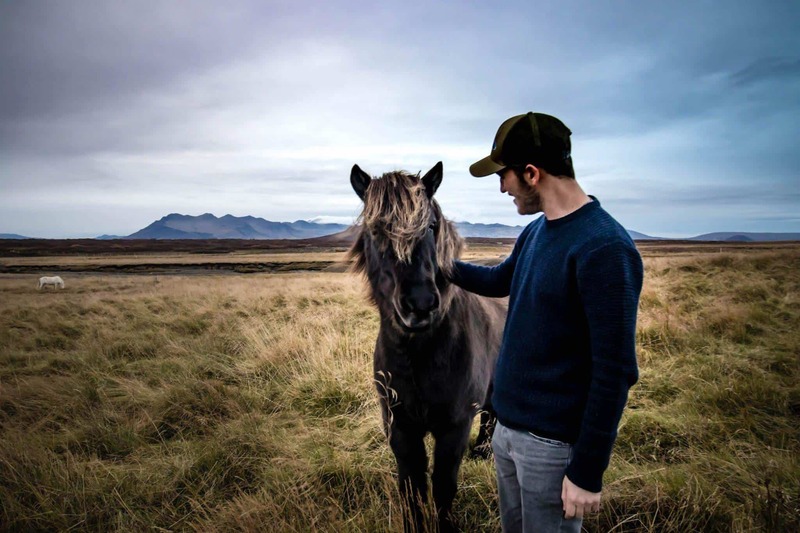 We spent the morning horseback riding in Skagafjörður (“horse valley”) which is an ideal thing to do if you on a honeymoon or special trip to Iceland. Hestaport has one, two, and three-hour rides and runs all year round. The ride was exciting as we got to learn about the Icelandic horse breed and practice a few river crossings via horseback. We didn’t have a far drive as we went to Northern Iceland to do some hiking around Skíðadalur Valley before retiring for the night. Up until now, many of the places we visited you may not have heard of. That’s because much of Iceland’s tourism is located in the South. From the Skíðadalur Valley, we drove to Goðafoss. Goðafoss waterfall is one of the most famous in Iceland and well worth a long stop. Goðafoss translates to “The Waterfall of the Gods,” and is an impressive sight to be seen. Then Icelandic weather got the best of us, it started to pour rain. We hung out in our camper van for a few hours waiting for the rain to settle. This is when we were thankful for our large camper van and WiFi. We were able to catch up on some work emails before setting off to Myvatn. We woke up next to Lake Mývatn and admired her beauty. With the peaks of the Krafla volcano and Mt Hverfjall as nice subjects for photos, we went for a hike around the Dimmuborgir lava fields before heading to the Hverir geothermal area. This geothermal area here is like another planet. We hadn’t showered in two days since it was off-season and many campsites were closed. Luckily in Egilsstaðir, the capital of the east, we found a local swimming pool for a dip and shower! It was by far the best public swimming pool we visited in Iceland. They had a slide, sauna, lap pool, two hot tubs, and a cold plunge, make sure not to miss the pool! 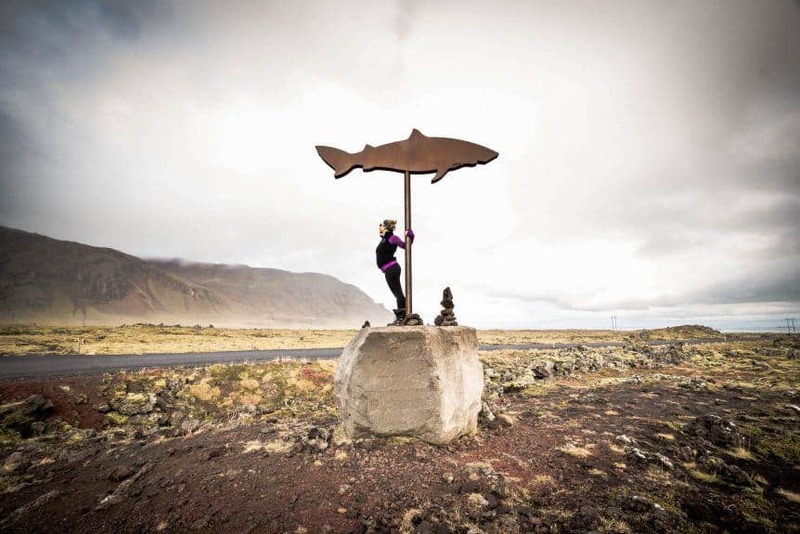 Where to stay: Reyðarfjörður Campsite. Toilets and Showers as well as a great camping area. This campsite was closed in mid-October, but we parked here anyway with no facilities. Best day of the trip! We had amazing weather, watched a sunset over a beautiful glacier lagoon, and saw the Northern Lights. The drive around the Eastern Fjords is epic as roads are not crowded. Since it has no big “sights” and it’s far from Reykjavik only a few tourists make it out here. However, it’s spectacular. We stopped so much that we just got to Jökulsárlón by sunset, which made for epic photos with a clear pink and blue sky. Right across the street from Jökulsárlón is Diamond Beach, where you can get up close to the Icebergs! With a good Aurora forecast, we parked in front of Skaftafell and watched the sky dance for at least three hours. It was quite late when mother natures show was over so we drove to the next town of Kirkjubæjarklaustur to camp. It’s a basic campsite next to a beautiful waterfall called Stjórnarfoss. Where to stay? Kleifar Campsite which was free to park your car at in the offseason. There was a toilet but no other facilities. We started our day in Skaftárhreppur in Suðurland area to hike up to Systrafoss. The hike only took about 10 minutes and once at the top, we stayed for 20 minutes. Afterwards, we made our way to Fjaðrárgljúfur – an iconic canyon in Iceland that is well worth a stop. 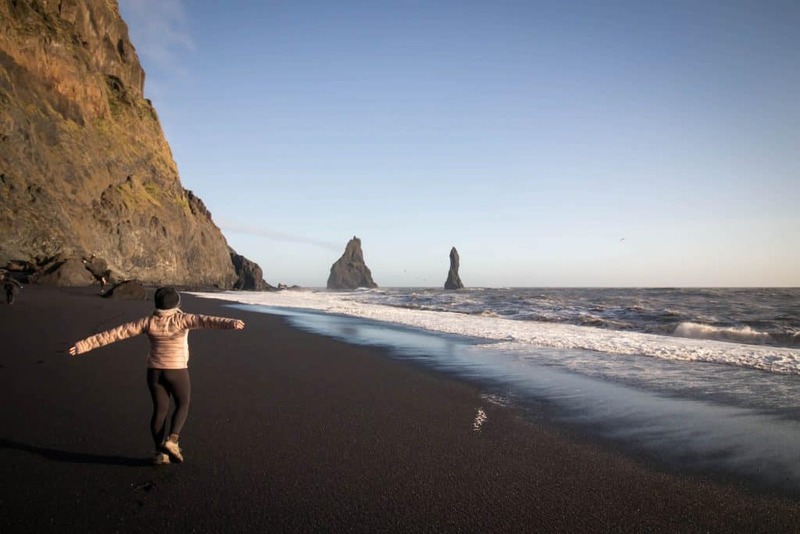 Make sure to stop at Reynisjafara, the famous black sand beach in Iceland. 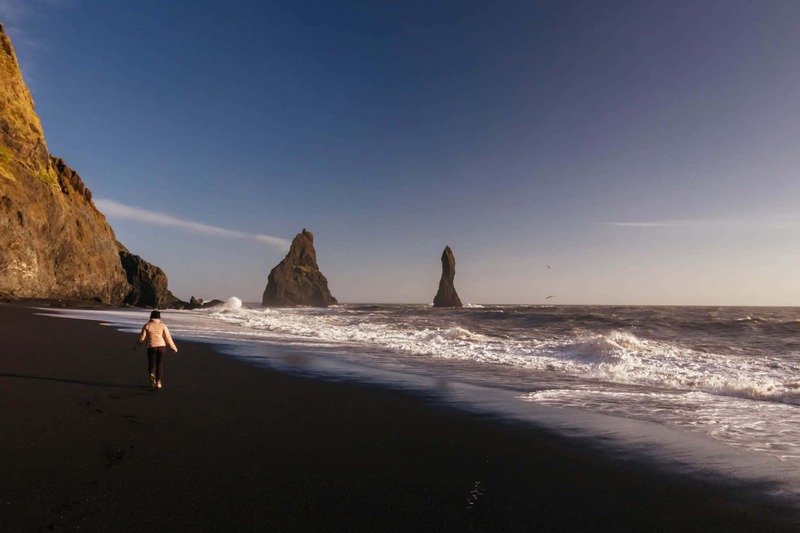 It’s a wild beach with two massive sea stacks, black sand, and basalt columns. Seljavallalaug is the oldest pool in Iceland and it’s set in a gorgeous setting. To reach the pool you need to take a short drive down a bad gravel road and then hike 20 minutes. The pool isn’t much for swimming with abandoned changing facilities, chilly water, and poor water circulation. That being said it’s well worth a stop and photo. The next stop is Skógafoss. It’s one of our favorite waterfalls in the world and just off the main road, you will be able to see it as you drive the Ring Road. Plan to spend some time here taking photos, hiking up its side, and enjoying a coffee at the cafe. There is also a campsite if you don’t want to leave. Where to stay: Skógafoss waterfall campsite. We couldn’t leave! The Golden Circle is a 300-kilometer trip that many people do as a day trip since it is close to Reykjavik. 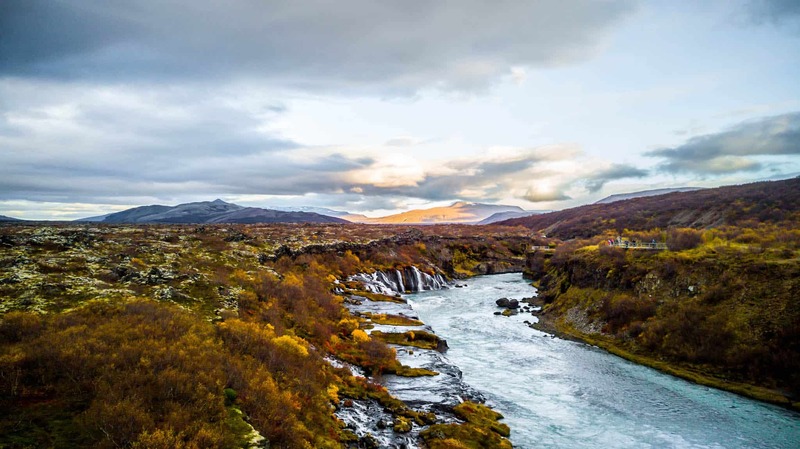 The Golden Circle includes Þingvellir National Park, Geysir, and Gullfoss. We recommend you also stop at Kerið crater along the route as well. 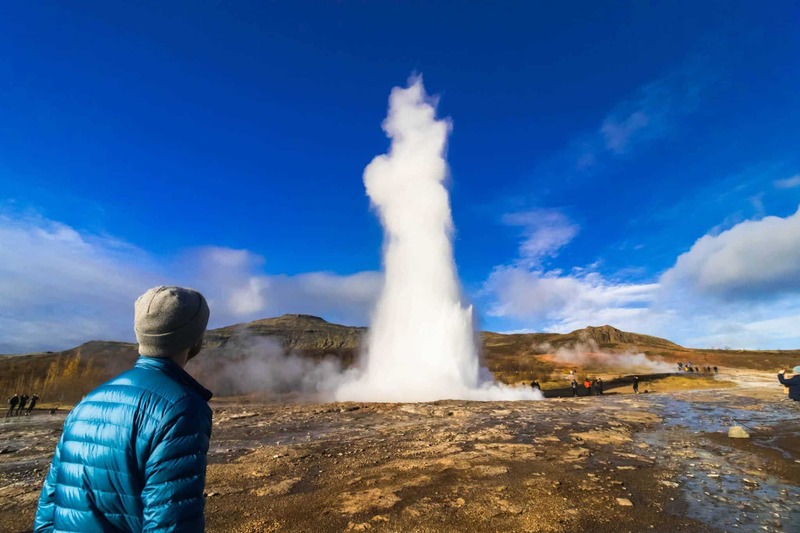 The Golden Circle is a super popular drive, so expect lots of tourists. Perhaps, this is why so many people choose to go counter-clockwise on the Golden Circle, start off with the hordes of tourists. We spent the night outside of Reykjavik, in case the Northern Lights were to make an appearance again. We wanted to be away from the light pollution so we went for a dip in a local pool in the town of Hveragerði and camped overnight there! The town makes a great stop as it is known as the Hot Spring Capital of Iceland and they have a flowing hot spring river! Where to stay? Hveragerði Campsite. Closes in the winter, but you still may be able to park your vehicle here overnight. We really wanted to get out to Landmannalaugar, which is where they film movies like Oblivion and Prometheus. However, you need a tough 4×4 to get to Landmannalaugar. We returned the van, stayed in Reykjavik and went on a private tour with Moonwalker Tours. Bessi our guide picked us up bright and early and we made our way to the middle of Iceland. 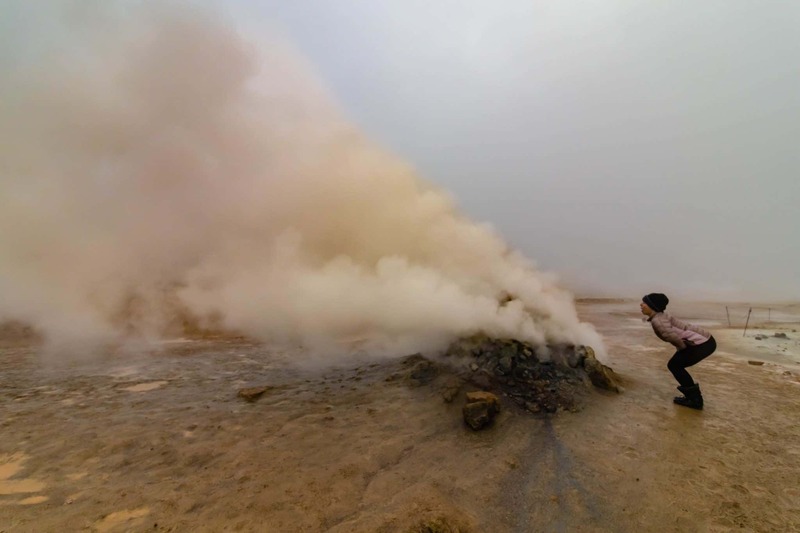 We ventured around Llaandmannalaugar in his 4×4 and we were able to soak up the heat in natural hot springs. Afterward, we drove up Mount Hekla, a volcano long overdue for an eruption and had the most fabulous views. Again, this is something we would have either had to hike to or have a 4×4 with local knowledge. Afterward, we convinced Bessie to take us to Háifoss waterfall. Háifoss. Háifoss is one of the tallest single drop waterfalls in Iceland and will give you serious vertigo. Right next to it you can find Granni as well! This was one of the best days we had in Iceland and I was pleased that we didn’t see many other people around as it is off the ring road. We were informed that in the summertime it gets crowded with tourists driving off-road in their small cars, which I wouldn’t recommend. Please keep in mind your rental is not insured on F roads (including 4×4) and any driving off of the road is illegal. 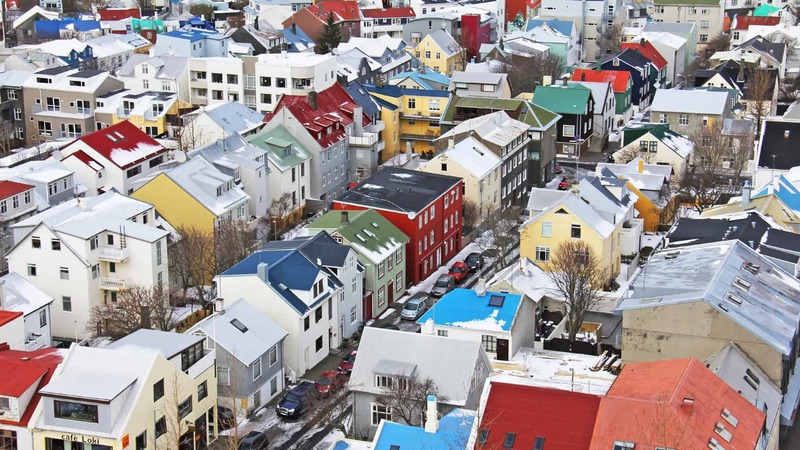 Reykjavik is a charming city and well worth exploring. We used CenterHotel Midgardur as our base, which is centrally located and one of the more affordable places in Reykjavik. From there we walked around Reykjavik for the day and saw the famous Hallgrímskirkja church, enjoyed the sunshine in the Klambratún Park, and had a fabulous dinner at Matarkjallarinn. Where to stay? CenterHotel Midgardur. Centrally located hotel with comfortable rooms. For a budget option, Kex hostel is great. Is an Iceland road trip expensive?